Having had an idea for a mage build that relies on the Vanilla Spell Absorption tendency to absorb summon spells you cast, I decided to restore it. Requires Dawnguard, & Dragonborn, probably pointless without USSEP. 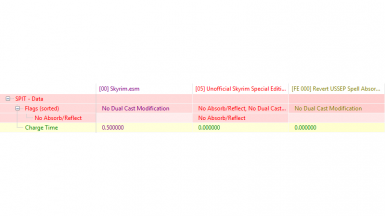 Unofficial Skyrim Special Edition Patch Not a "Hard" requirement. - Advice from reddit user /u/Antediluvian_Cat_God. I removed the "No Absorb/Reflect" flag from every summoning & reanimation spell I found where the USSEP had added it, and "Guardian CIrcle", my research on the UESP wiki suggested Bound <Weapon> spells weren't affected (or at least they weren't mentioned), if anyone thinks I've missed something I should've changed, or have changed something I shouldn't have, just mention it in the posts/comments & I'll see what I do (Note: The idea was return to functionality before the Unofficial Patch fixed stuff, so I'm not saying the USSEP/USLEEP fixes were wrong, just that it is possible that I'm not the only one who might want to play without these specific ones). I also removed it from the Shadow Warrior Sneak Perk, as that was also subject to absorption in the vanilla game. I believe i left it in place for all abilities, powers, & diseases, because those aren't spells (& there are mods to restore this absorption of diseases, also I wasn't sure whether things like the Black Book powers should be covered or not, so I went with "not").